India won a Test series in New Zealand after 41 years. Cricinfo runs the rule over those who contributed to the memorable achievement overseas. He set up a win in Hamilton, saved a match that looked lost in Napier, and batted New Zealand out in Wellington - the three main jobs an opener is expected to do. Three ticks in three boxes. In the process, Gambhir also removed a few question marks over his temperament and doubts over his batting outside the subcontinent. He loses out on a perfect 10 because he had a century for the taking in Hamilton, and played a loose shot when on 72. The revelation of the tour for India. Harbhajan enjoyed being the lead spinner, taking wickets and also tying one end up for the fast bowlers to do their job from the other. Almost everywhere in New Zealand, one end tended to be more helpful to the pacers. Harbhajan bowled unbroken spells of 23 overs and 17 overs into the Wellington wind, and gave nothing away. The leading wicket-taker in Tests, he had the best bowling average and topped the wicket charts in ODIs too. He got early wickets every time. Hostility, precision, and intelligence all worked for him, resulting in 13 wickets in the Tests. Zaheer crossed 100 wickets outside India, at a better average and strike-rate than any Indian bowler. He promised a five-for in Wellington if the batsmen saved the Napier Test, and delivered, securing the series on the second day of the last Test. Didn't disappoint the fans - who thought this could be his last trip to New Zealand - at all. Some of his fluent batting rolled back the years, and reminded of the Tendulkar of the old. He continued from where he left off in the Christchurch ODI - 163 retired hurt - with a 160 in the Hamilton Test. Big scores went uncharacteristically missing, but New Zealand did exceptionally well to escape with 49, 64, 62 and 9 in his last four efforts. Laxman missed out in Hamilton, where India had taken complete control by the time he arrived. But in Napier, all of his artistry was on show. He was disappointed to get out on 71 in the first innings, becoming a part of a collapse. But in the second innings, he scored a hundred that was a perfect blend of caution, fluency, and breathtaking strokeplay. Another half-century in the last Test took his tally to 295 runs at 73.75. Completely shrugged off his poor run of form. He was the most consistent Indian batsman with scores of 66, 8 not out, 83, 62, 35 and 60. 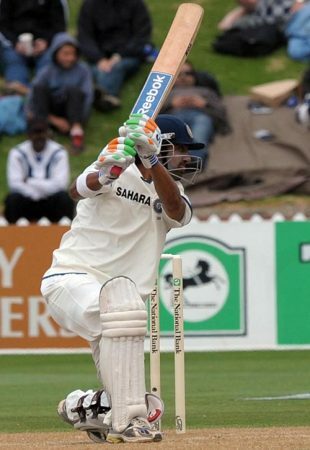 It was very unlike Dravid to miss out on so many opportunities to score centuries. He played a poor shot once, which resulted in the collapse in Napier, but was the first to take the blame for it. He made up for it with a dogged half-century in the second innings, where an ordinary umpiring decision robbed him of another century. What he brings to the side became glaringly obvious in the Napier Test that he missed. His wicketkeeping and batting at No. 7 were badly missed, apart from his captaincy. It's tough to put a finger on what difference he makes tactically, but there seemed to be a different level of energy to the team when he was the captain. Missed out on explosive starts in Hamilton and Wellington and attracted criticism for shot-selection against spinners two evenings in a row in Napier. Nevertheless Sehwag kept the opening bowlers honest as some of the mental disintegration from the ODIs stayed with Test bowlers as well. He put bowlers off their plan on the fresh Wellington pitch. Didn't live up to the high expectations leading into the tour. Ishant struggled in the Wellington wind, but was impressive in Hamilton. Eight wickets at 41.75 wasn't a fair reflection of the pace and discomfort he managed to create. He just wasn't consistent enpugh. The tour was representative of Munaf in general. When he got going in Hamilton, he took more wickets than any fast bowler in the match. When he started to go for runs in Napier, a dropped catch notwithstanding, he looked lethargic and disinterested. Munaf was underused in Wellington, but if he bowls like he did in Hamilton, he could solve the problem of the third seam bowler. Undid the good work from the Test series against England. Napier was a situation tailormade for him to make a Test name for himself, but couldn't survive the new ball. Dropped catches in the slips wouldn't have helped his confidence. Yuvraj will have to start a new Test innings all over again.